Happy Navroze to all our readers and supporters – HAVE A GREAT YEAR AHEAD! SAN FRANCISCO, Jan. 24, 2019 /PRNewswire/ — Persian New Year (“Norooz”) will be celebrated in grand fashion in 2019 in San Francisco. On Saturday, March 9, 2019, San Francisco’s Union Square will be the site of an inaugural all-day “Norooz Spring Festival,” celebrating the arrival of Spring in the millenia-old joyful tradition of Norooz. 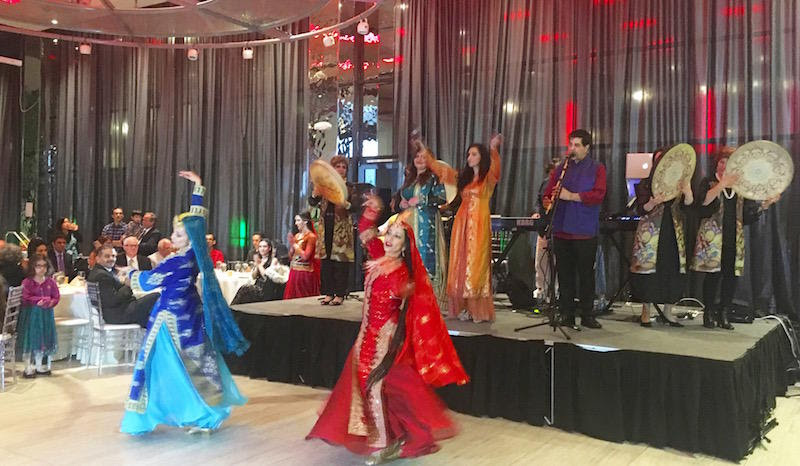 The day’s festivities, which are presented by Norooz Outreach and Diaspora Arts Connection, will include food, live-music, dance, Persian calligraphy and miniatures, activities for children, and other demonstrations of the symbols of Norooz. For over 3,000 years, Norooz—translated as “new day” (a combination of “new” (no) and “day” (rooz))—has marked the Persian New Year, celebrated worldwide by diverse communities in many countries. 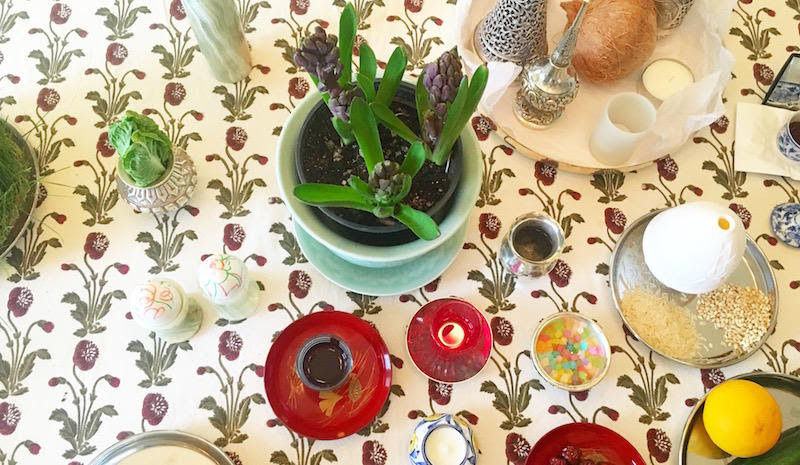 With roots in the Zoroastrian tradition, Norooz has become a secular holiday celebration for people across many different faiths. Norooz is marked at the precise moment of the vernal equinox, representing the formal beginning of Spring in the Northern Hemisphere (often on March 21). The Union Square Norooz Spring Festival on March 9 will have activities all day, from 10 a.m. until 6 p.m. Come and enjoy the arrival of Spring with your friends and family! Norooz Outreach is an initiative founded and funded by the HAND Foundation to establish Norooz as an enjoyable new American tradition: A celebration of the beginning of Spring and the renewal of life, and an opportunity for Iranian-Americans and other celebrating communities to share the Norooz tradition with their neighborhoods, schools and the American community at large. “Holding a Norooz Spring Festival in Union Square is a perfect way to support the mission of Norooz Outreach, which is to connect populations outside the Persian community with the joyous and renewing tradition of Norooz,” said Nosheen Hashemi, the cofounder and President of the HAND Foundation. Diaspora Arts Connection is an organization committed to the support of artists in diaspora and their empowerment through performing their art to supportive audiences across the Bay Area. “After decades of life in the beautiful and diverse community of Northern California, the Iranian diaspora community is pleased to give back and enrich its surrounding communities by bringing this heartfelt celebration of earth and renewal to the Bay Area community at large,” said Nazy Kaviani, the founder and Executive Director of DAC. Check out the event details here. Zoroastrianism is a monotheistic faith that began in ancient Iran over 3,000 years ago. The Bay Area happens to be a hub for the Zoroastrian community, whose global population has dwindled to just over 100,000. 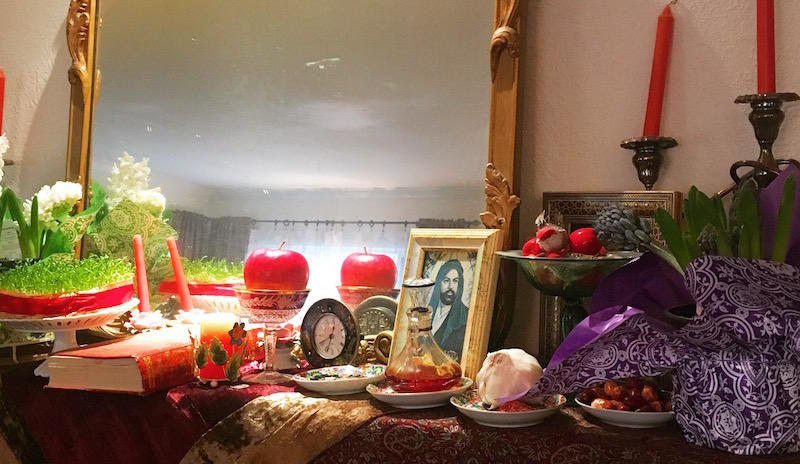 With Nowruz (Persian New Year) celebrations winding down, KALW’s Asal Ehsanipour set out to explore her roots by learning more about modern-day Zoroastrians in the Bay Area. It’s the first day of spring, and I’m welcomed by the smell of fresh herbs as I walk through the door of my aunt and uncle’s home. My entire family is scattered around the house, and orange tulips bloom everywhere. We’re here to celebrate the Persian New Year, Nowruz, which translates to ”New Day.” We feast together on Persian foods, such as herbed rice and fish, as my cousin gives her niece new money, a customary gift. The customs of Nowruz are shared by people of all faiths in Iran and its diaspora — Muslims, Jews, Christians, Baha’is. But its rituals actually come from Zoroastrianism, a monotheistic faith that began in ancient Iran over 3,000 years ago. It was the dominant religion during three Persian empires, and remains one of the oldest religions in the world. A close up of Nazneen’s haftseen table, which means “seven sins” or “s” in Farsi. The day after Nowruz, I find myself in Palo Alto, washing my face with rosewater as I arrive at the home of Niloo Farhad. Now, Niloo does not consider herself a very observant Zoroastrian, but she believes in the spirit of Nowruz: What you do on the new year carries you through the rest of the year. 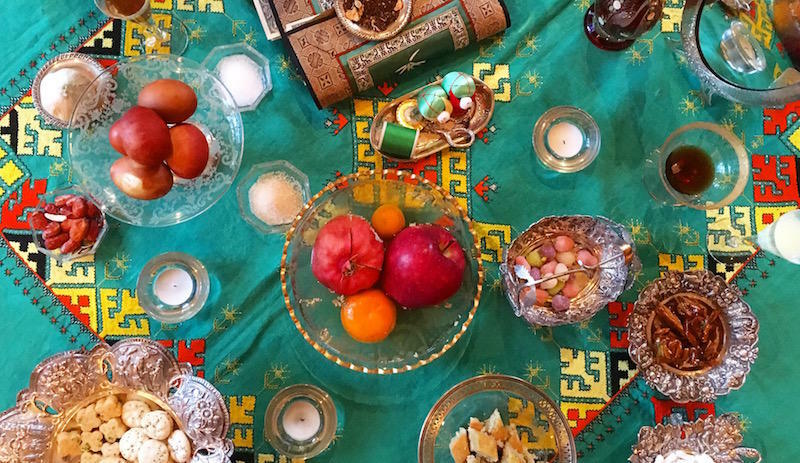 Like many Iranians, Niloo follows certain traditions every year, including creating the customary altar, called a haftseen table. The word means “Seven S’s,” and each of the items on the table starts with a “ssss” sound. “Sib, which is apple, symbolizes health,” explains Niloo. The haftseen table reflects wishes for the year to come, with roots stemming back to the number 7 and the Zoroastrian creation story. However, the table isn’t a mandated practice; people of all religions include books of worship, such as the Torah, Bible, or Koran. Some Iranians even include Sufi poetry as a symbol of their ideology. Niloo says that inclusivity is what Nowruz, or Persian New Year, is all about. Persian kings such as Darius popularized the holiday, which created a tradition of celebration across modern-day Afghanistan, Turkey, and, of course, Iran. Each year, the Persian Zoroastrian Organization hosts a Nowurz party to ring in the new year. Today, Nowruz is regarded as both religious and secular. Religious in that Zoroastrians are expected to clean their houses and go to the fire temple. However, it’s secular in that even the non-observant gather with family for celebratory meals. Every year at the beginning of spring, hundreds of local Zoroastrians gather in San Jose, where the Persian Zoroastrian Organization hosts a party in honor of the new year. Khashayar Anoosheh, or Kashi for short, moved to the Bay Area in the early ‘80s, back when there were just a handful of Zoroastrians here. As the community’s grown, he’s tried to preserve its teachings, like thoughtfulness. Some call Zoroastrianism more of a philosophy than a religion. It’s reflective and there’s no official day of worship. Therein lies an obstacle to preserving the culture. Kashi says that on the one hand, it’s good to have progressive thinkers who make independent choices. Each year, the Persian Zoroastrian Organization hosts a Nowurz party to ring in the new year. Traditional Iranian dancers and musicians entertain the hundreds of Bay Area Zoroastrians who attended. At the party, I watch people greet each other with a kiss on each cheek, before the kids lead a prayer to ring in the new year. Traditional Iranian music starts. And then, a little girl approaches the dance floor, absorbed in Persian dance. The party is set to go on like this until midnight. But while the Persian Zoroastrians were celebrating Saturday night, the Parsis were having a Nowruz party of their own. Now, the Parsis also practice Zoroastrianism, but come from India and Pakistan, where they settled after leaving Iran sometime between the 7th and 10th centuries. 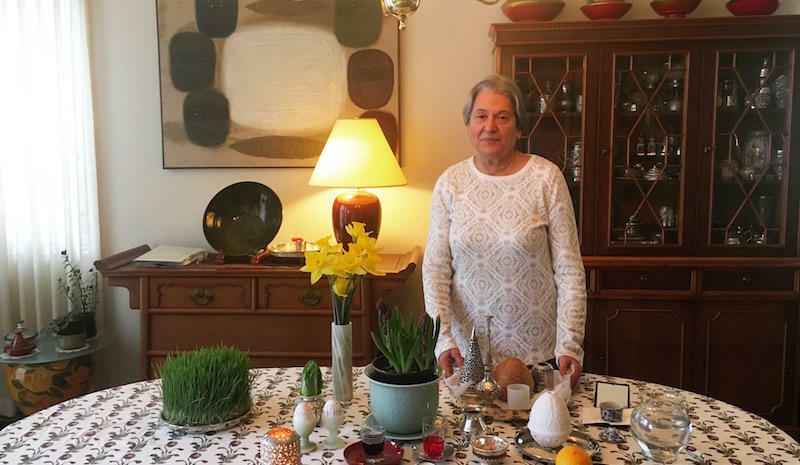 Nazneen Spliedt, former president of the Zarthoshti Anjuman of Northern California, with her haftseen table at her South San Francisco home. Nazneen is Parsi, and only began making haftseen tables of her own when she met the Iranian Zoroastrians of North America. haftseen table at her South San Francisco home. Nazneen is the former president of Zarthoshti Anjuman of Northern California, the Parsi organization here in the Bay. “Parsi,” literally means “From Persia” in Gujarati, a language native to the Indian subcontinent. But with a recent migration to North America, Iranian Zoroastrians and Parsis have come together for the first time in over a thousand years. “They were different and yet they were alike,” says Nazneen. Different language, different food, different culture. “Then when we go back to see a little bit of the culture, we see we always used to eat this dish, but now we can see the [original] did come from Iran,” she says. Nazneen says the convergence of communities here in North America allows the next generation of Zoroastrians to come together. They even share a Zoroastrian temple in San Jose, one of only eight across all of North America. So while different languages once divided them, English can bridge that divide. Since the Zoroastrian community is so small, so scattered, this reunion feels even more important. The Zoroastrian population is shrinking, with a little over 100,000 globally, according the Federation of Zoroastrian Associations of North America. However, the Bay Area numbers have grown — especially in job-rich Silicon Valley. Jamshid Varza noticed this growth back in 1996, but found there wasn’t a single place his kids could learn about their Zoroastrian heritage. He says it started one morning when he was at breakfast talking with his wife Mitra. So Jamshid and Mitra started a Zoroastrian school. Turns out, students loved it. And eventually, it brought Zoroastrians of all ages together. The Zoroastrian classes still exist, but not under the Varzas. Since then, Jamshid’s been producing documentaries on Zoroastrianism. He also helped start Stanford’s Zoroastrian lecture series, which became a department that lasted six years before the professor who led it transferred to Oxford. Jamshid and Mitra say these efforts have given the next generation a feeling of belonging. “Just a sense of ‘so this is what I believe. That’s what my ancestors believe. This is where I come from. This is what they did. This is how is all happened,’” says Mitra. Mitra says education does more than bring Zoroastrian kids back to their roots. Traditions like Nowruz inspire regrowth. It’s the celebration of life. Of what sustains us. Magical for everyone. After all, the beauty of Nowruz is that it extends to people of all faiths, whether you’re Zoroastrian or not. When Sun enters in Aries sign (Mesh Rashi) acc. to Sayan (western Astrology). The Jamshedi Navroze day is celebrated by Mazdayasni Zarthosti in a very special way. It does not fall on any of the Zoroastrian Roj – Mah calendar which we follow for our other religious ceremonies. The day commences with the advent of spring when Sun enters the sign Aries when it reaches the Nothern Vernal Equinox which occurs around 21st March. On this particular day the Khurshed Yazad shines with its full glitter and glory and spreads its sunshine (roshni) on this Geti (earth) abundantly. On this auspicious day the following prayer is recommended in praise of Khurshed Yazad and to get his bountiful blessings. The above order makes one set of prayer. Likewise one should pray 3 such sets in the same order. This will end up in reciting 9 Khorshed Neyayesh, 3 Meher Neyayesh and 3 Vispa Humata prayers in Havan Geh. Two sets of prayers in Rapithwan Geh, maintaining the above order. That means in Rapithwan Geh one will recite 6 times Khorshed Neyayesh and 2 times Meher Neyayesh. It is important to note that in Rapithwan Geh the Vispa Humata prayer is NOT to be recited. Note: However when Havan Geh is recited from Hormazd roj of mah Avan till the last Gatha (Vahishtoisht) instead of Rapithwan Geh, (Second Havan Geh) one should follow the prayer set given above for Havan Geh, but only 2 times, and NOT 3 times. Only one set as prescribed above is to be recited in this Geh. Thus in Uzirin Geh one would recite 3 Khorshed Neyayesh and 1 Meher Neyayesh. No Vispa Humata prayer in Uzirin Geh. This set of prayers in the three different Gehs is to be recited only once in a year. It is highly recommended to a true Zoroastrian to do so and get the benefit out of it. In our Mazdayasni Daen there is a wealth of prayers out of which a wise person can select some. This week, I would like to send my best wishes to all those around the world celebrating the wonderful ancient holiday of Nowruz. Many millions of people of Iranian, Iraqi, Turkish, South Asian, and Central Asian heritage will come together with their families during this time to commemorate the arrival of spring. Nowruz means “new day” in Persian. It is an occasion to celebrate new beginnings, a sentiment that is particularly meaningful for so many Iranians who have come to our country in recent decades to make a new start in a free land. For many years, I have greatly enjoyed wonderful friendships with Iranian-Americans, one of the most successful immigrant groups in our country’s contemporary history. They come from diverse religious backgrounds—including Muslim, Jewish, Christian, Zoroastrian, and Baha’i—but all share an affection for their ancestral heritage. To the Iranian people and all those around the world celebrating Nowruz: On behalf of the American people, I wish you freedom, dignity, and wealth. Nowruz Pirouz (Happy Nowruz). Nowruz Celebration on Canada’s CTV network !